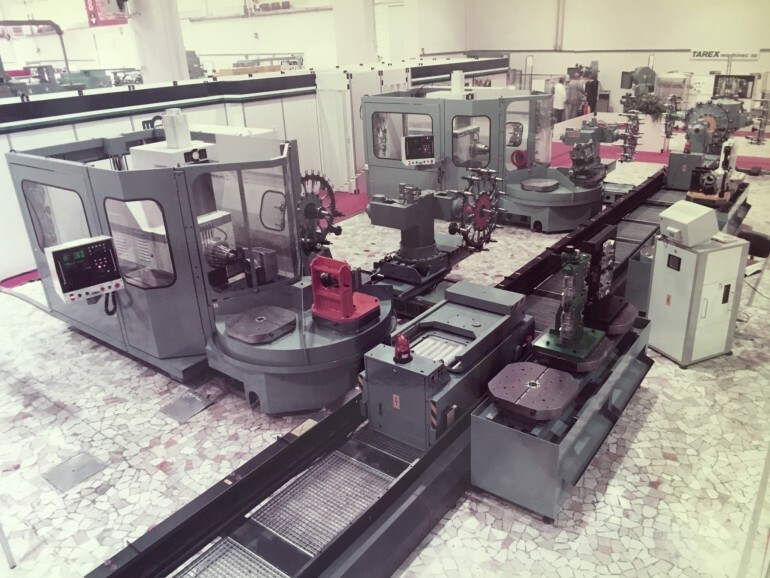 • Establishment of the company with the name Machining Centers Manufacturing, shortened to MCM S.p.A.
• Debut of the first MCM machining centre named Progress, equipped with a horizontal spindle and wheel tool changer. • Market launch of the Connection horizontal machining centre with built-in 4-position multipallet system and wheel tool magazine with tool holders arranged on 2 concentric circles. It boasts the innovative use of Numerical Control based on an industrial PC and achieves great market success by forming the basis of business development. 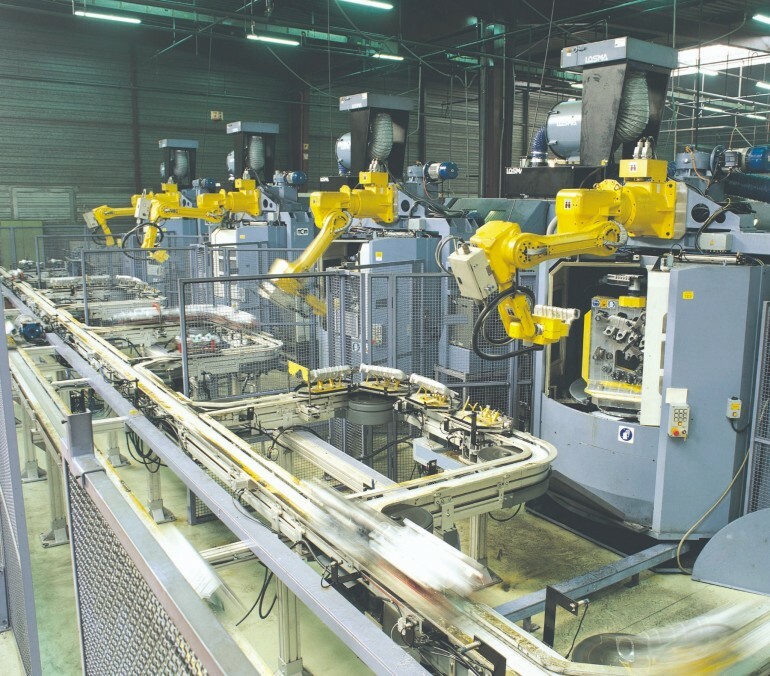 In the following decade, more than 600 machines are manufactured and installe. 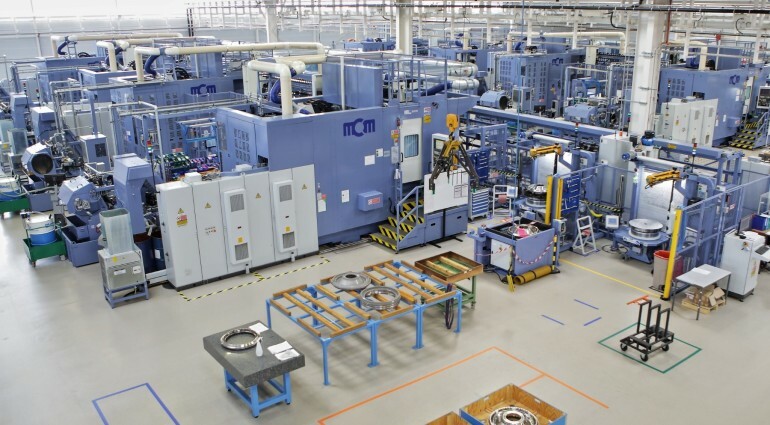 • Just a few years after its establishment, MCM begins its collaboration with Ferrari Auto through the supply of the first machining centre, followed by many others in the subsequent years. • This marks the beginning of the collaborations with large industrial manufacturing partners. 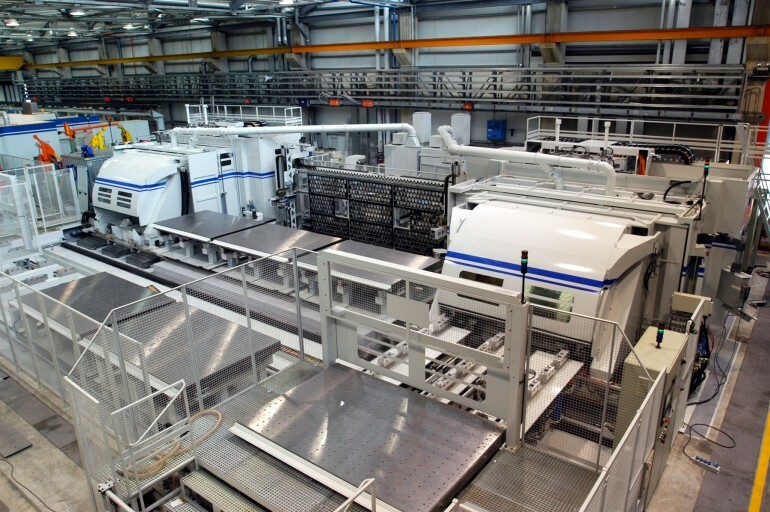 • Manufacture of the first major flexible manufacturing system (FMS) for Lucas Girling (UK), designed for the manufacture of braking systems and consisting of 10 in-line machining centres connected by automation elements. This is the first supervision software applied to the production line - all based on MCM technology. • MCE, the IT division of MCM, is established for the implementation of the supervision software on the LUCAS plant and for the development of software solutions dedicated to the management of complex plants. • Establishment of the MCM France facility is the first step towards an international structure. • The Mirror tool magazine, used by two machines, is conceived for shared and optimized tool management. The significance of the benefits is such as to make this solution still relevant today. • MCE develops the new FMX supervisor that significantly enhances the performance of the NCs of that period. The resulting supervisor has a huge impact on the level of flexibility and productivity of MCM systems. • Market launch of the new Action machining centre to meet the machining requirements of larger workpieces up to an X-axis stroke of 2200 mm. • The MCM Scara system tool magazine is patented, developed on a horizontal plane with polar coordinate Scara robot. The tools simply rest in their housings. • MCM develops its prototype of AGV (Automated Guided Vehicle), wire-guided carriage for pallet management with self-aligning system without mechanical references to the ground. • MCM pursues the concept of total flexibility also through linear pallet systems (FMC, FMS) and multi-pallet circular systems with different positions on one or more levels. These configurations will be made available for all models in the growing range. • With the acquisition of an important order for Sidel group, that processes molds for PET bottles, MCM develops its first 5-axis machining centre with tilting table. This is a milestone for the development of the range. • The new Clock HP machining centre features a 20,000-RPM HSK 63 high-speed milling spindle and a very fast tool change (lower than one second). A new state of the art to reduce production times. • The versatility of Clock module becomes the basis to develop different versions, becoming the new standard of MCM range. 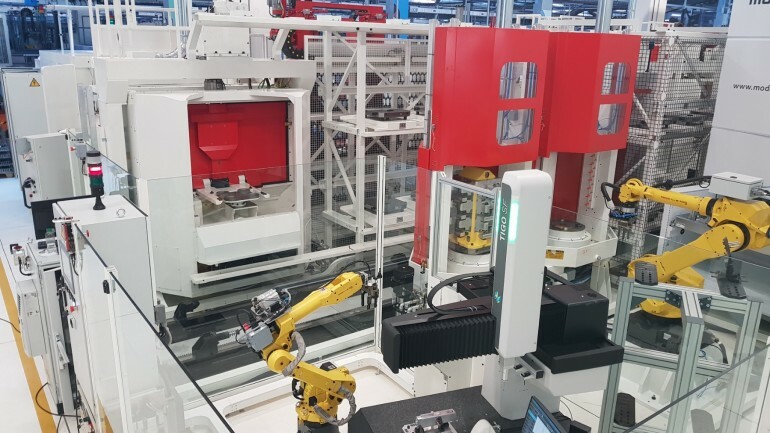 • With the Clock 800 module, MCM develops for VM Motori an FMS system consisting of 4 machining centres, complete with automation and served by synchronized gantry robots for workpiece loading and unloading. 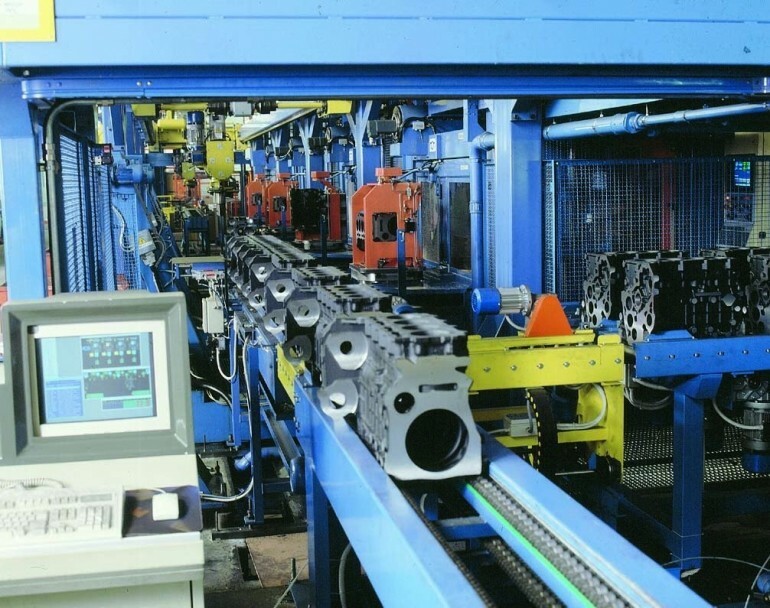 Workpiece feeding through continuous roller conveyor. • Acquisition of the first order in the aerospace industry. 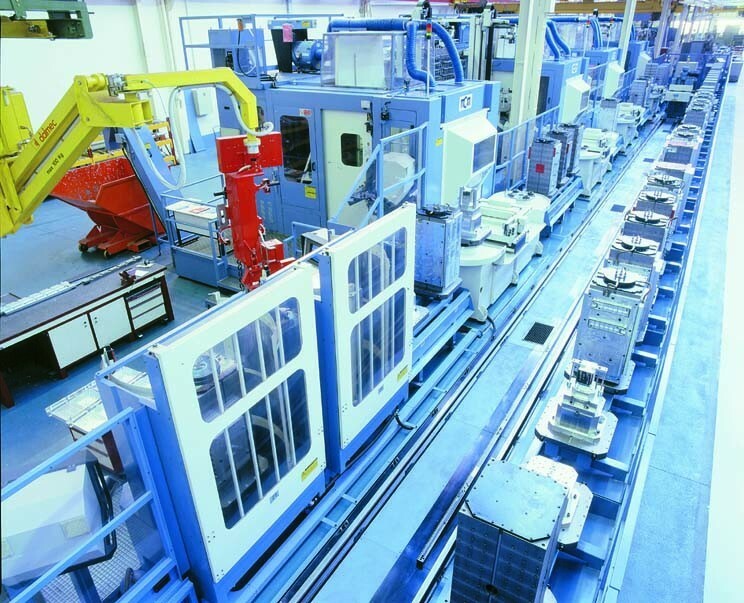 Dassault Aviation chooses the MCM flexible manufacturing system consisting of four 5-axis Clock 900 Mirror machining cells. • The company take part for the first time in the International Paris Air Show at Paris-Le Bourget. 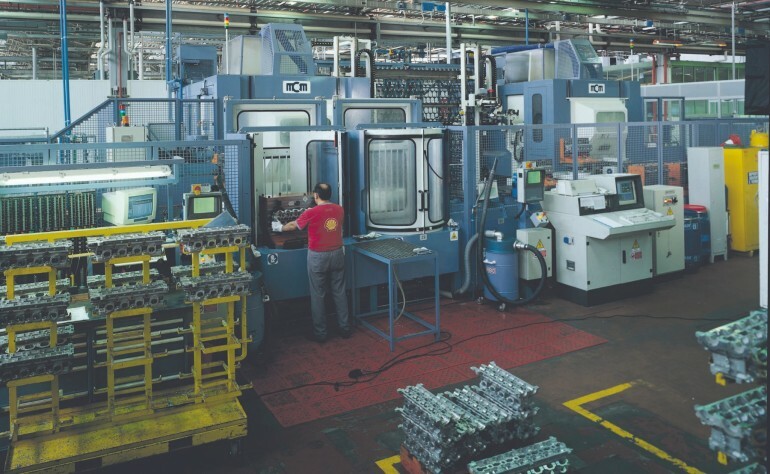 • Development of the new Clock 600 Auto version dedicated to the automotive industry, which is chosen in Italy, France and the United States by the main subcontractors, in the various configurations available combined with robots and FlexLink automation systems for workpiece feeding (MCM Cyclops). • The internationalization process continues with the establishment of MCM Deutschland and MCM USA. • Debut of the new Forerunner, one of the first applications of linear motors to a machining centre in the world. This solution features very high dynamics and reliability, thus allowing MCM to step into the markets of aluminium alloy processing, in particular for turbine blades. • Acquisition of the first Safran order (Snecma Gennevilliers, now Safran Aircraft Engines) for the production of turbine blades with two CLOCK bi-pallet machining centers. • Creation of Metrology department and implementation of the first Leitz measuring machine at MCM. • FMX becomes jFMX on Java Virtual Machine platform (JVM) and at the same time it is decided to use the web browser as the key to the user interface, bringing the management back to the PC. • Acquisition of the first Hispano Suiza order (now Safran Transmission Systems) for the production of transmission gearboxes for aero-engines. The 4-axis Action machining centre, complete with process, has proved to be a winning solution in guaranteeing the very high precision required. • Debut of Action machining centre in 5-axis version with tilting head. • Introduction of the Jet Five family of machines with linear motors for machining of large structural parts, both in titanium and light alloys. Thanks to its versatility, this machine is the ideal solution for various industries, especially in the aerospace sector. • First Tank 1300 machining centre, the progenitor of the Tank range, characterized by innovative structural concepts for optimizing static and dynamic behaviour. • Aermacchi (Leonardo) purchases an FMS consisting of two 5-axis JET FIVES with tilting table and 3000x2000 mm pallets, for highly dynamic and precise machining of large aeronautical aluminium structural components. • EADS (Augsburg D) purchases a 4 JET FIVE FMS for machining of titanium structural parts (main FLAP). The 4 machining centres served by shuttle process titanium alloy workpieces with a length that can reach 2 metres. The required chip removal volume is impressive and is combined with the need to reduce tool wear. The system allows processing the solid material directly with a 400mm diameter mill and cutting speed of 40m/min. • Implementation of Tank range with new size frames and X-axis stroke from 1300 to 2600 mm. • Agusta Westland (Leonardo) commissions an Action 2200 5-axis machining centre with tilting head for the complete machining of helicopter rotors. The machine processes the whole workpiece and certifies the process. • Within the research project “Innovative Production Systems”, MCM presents Concept 600, the high-speed machining centre available in four-axis, five-axis or multitasking versions. • The Tank family also becomes multitasking: it can provide all the configurations required for multitasking machining (turning, milling, boring and grinding), adapting to each sector but particularly meeting the growing demands of the aerospace industry. • The Action machining centre with tilting head and multi-pallet, complete with process, is installed at CESA, an important Spanish subcontractor of Safran, to process the landing gear for the Airbus AM400. • As part of an important order for the international group MTU Aero Engines, MCM delivers the first Tank 1300 Multitasking machining centers for turning, milling and grinding. • The ‘Level2’ service package of jFMX supervisor is placed on the market, allowing production control to be extended from the single FMS / production cell level to the factory level. New opportunities open up for the integration of automation systems and solutions. • MCM develops in co-engineering with Messier Bugatti Dowty (now Safran Landing Systems) a system consisting of four multitasking Tank 1600 equipped with a dividing unit and a special pallet exchanger dedicated to the machining of wheels and braking systems for aircrafts. • Debut of 5-axis and 6-axis Clock Dynamic machining centre, available in multitasking version, particularly suitable for the manufacture of small and medium sized components with complex geometry, such as blades for oil & gas turbines. • Safran Aircraft Engines entrusts MCM with the construction of the FMS system consisting of 12 multi-tasking Tanks equipped with dividing unit and special pallet exchanger to ensure the machining of titanium disks for LEAP engine. • RIFA Group acquires control of MCM S.p.A.
• MCM and Nuovo Pignone GE Oil &Gas implement an ambitious project of technological integration and synergistic automation. 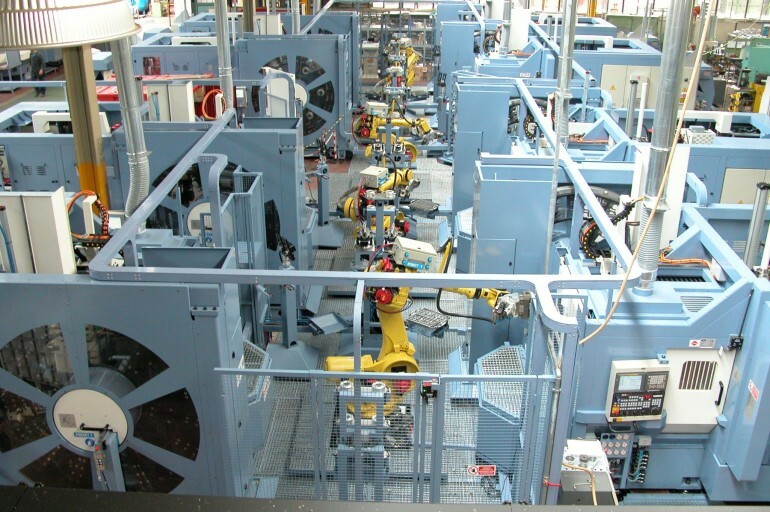 This plant integrates MCM machines, unconventional technologies, storage and measuring systems and robots. • AIRBUS places an important order for the construction of 6 Jet-Five machines in FMS configuration for machining of structural components in hard-to-machine materials (titanium alloys, special steels). • The jFMX structure is changed to include ‘Level0 - Flight Recorders’, which allows the most advanced collection and monitoring of data from machine sensors, supports preventive maintenance, extends life cycle management and defines the maintainability of machining centers and FMSs. • A new version of Clock family machining centers (800 and 1200) is developed. • MCM strengthens its presence on the Chinese market by winning an important order for AVIC (Aviation Industry Corporation of China) consisting of 10 Tanks 1900 in FMS configuration (mainly for the machining of aluminium alloys) and 3 Jet-Fives (version for titanium).